Schizophrenia Information > What Causes Schizophrenia? Although the exact cause of schizophrenia remains unknown, experts do agree that schizophrenia develops as a result of interplay between biological predisposition (for example, inheriting certain genes) and the kind of environment you are exposed to. These lines of research are beginning to converge: brain development disruption is likely the result of genetic and/or environmental stressors early in development (during pregnancy or early childhood), leading to subtle alterations in the brain. Environmental factors later in development can either damage the brain further and further increase the risk of schizophrenia, or lessen the expression of genetic or neurodevelopmental defects and decrease the risk of schizophrenia. Neither of these two categories is completely determinant, and there is no prescribed amount of genetic or environmental input that will ensure someone will or will not develop schizophrenia. Moreover, causal situations may be different for different individuals - while one person may develop schizophrenia due to a strong family history of mental illness, someone else with much less genetic vulnerability may also develop the disease due to a significant pre-natal or environmental stressor during their lives. This means that there is always hope, and always things you can do to reduce your own or your children's risk of developing schizophrenia. Recent scientific research on the causes of schizophrenia is increasingly suggesting that it may be possible to prevent many cases of schizophrenia through actions taken during pregnancy (before a person is born) as well as by actions throughout early childhood and later in life. Such prevention factors can be especially important for people who know they have a family history of any type of serious mental illness (depression, bipolar disorder, schizophrenia, OCD, etc.). There is no doubt a strong genetic component to schizophrenia - those who have immediate relatives with a history of this or other psychiatric diseases (for example, schizoaffective disorder, bipolar disorder, depression, etc) have a significantly increased risk for developing schizophrenia over that of the general population. However, twin studies have shown that simple genetic transmission is far from the whole story - if one identical twin has schizophrenia, the risk for the other twin (who has the exact same genes as his/her sibling) is only about 50%. This indicates a complexity of genetics and environment that is not yet well understood, rather than a case of single or multiple gene presence in the body automatically conferring a certain risk for developing schizophrenia. For almost as long as scientists have pondered how nature and nurture shape personality, intelligence, health (or disease) and other traits, they've assumed that each contributes some percentage to the trait. Maybe intelligence is 55% genes and 45% environment. As one science author noted - it used to be thought that the nature / nurture relationship in people was kind of like succotash is 60% corn and 40% lima beans. But it's becoming increasingly clear that people are not like this. Rather than nature (i.e. genes) and nurture (i.e. environment) each kicking in a fraction of the influences that nudge traits in one or another direction, new studies show, the innate potential we call nature becomes reality only when exposed to a certain kind of nurture. A gene contributes 0% of what you become if you don't grow up in an environment that turns it on, and environment contributes 0% if you lack the gene it acts on. But if both the gene and the environment that turns it on are present, then it's as if each contributes 100%. An example of this, researchers have suggested, is the the gene that has been linked to shyness -- the "shy gene" is called 5-HTT, and it comes in two forms. In adults, the short version has been linked to anxiety and to high activity in the brain's fear-generating amygdala. But in kids the picture of how the nature/nurture relationship has been fuzzy. A 2005 study found that children with two copies of the short form tended to be very shy, but earlier studies found no such connection. An explanation may be at hand, suggests a recent research study. "Only children with the short form of the gene and mothers who had little social support and poor social networks, which increases stress, were shy as 7-year-olds," says Prof. Fox, whose study appeared in the science journal "Psychological Science". Dr, Fox continued, "We don't know the molecular mechanism by which a mother's behavior reaches down to inhibit or elicit the expression of a gene, but clearly that's happening." There have been hints that shy toddlers stay shy if their parents are very protective. But if parents make a conscious effort to get their child to play with other kids, she is more likely to shake her "innate" introversion. After all, says Prof. Fox, a young child's brain shows an astounding ability to change in response to experience. In an earlier study, he and colleagues found that shy children in day care became less shy once they reached school age than shy kids who had spent their days with mom. Studies that support this new view of how nature and nurture combine to influence brain development are accumulating quickly. In 2002, scientists reported that boys with one form of the MAOA gene, long associated with aggression and criminality, had a higher-than-normal risk of growing up to be antisocial or violent only if they were also neglected or abused as children. If they had the "violence gene" but also a loving, nonabusive family, they turned out fine. The short form of 5-HTT is associated with depression and suicide, but only if you experience many highly stressful life events. Similarly, with schizophrenia it is becoming increasingly evident that having the gene(s) associated with schizophrenia is just a starting point. If you have the genes, but don't experience the environmental "triggers" for schizophrenia - then evidence suggests that you'll likely never get schizophrenia. If, however, you are exposed to certain environmental factors - then the chances seem to increase (and the more environmental factors a person experiences, the higher the risk) that the person will ultimately get schizophrenia. An example of this theory with regard to schizophrenia is a recent research study that indicated that people who had multiple copies of a version of the COMT gene and who smoked marijuana had a 1,000% increase in their risk of developing schizophrenia. (source: Biol Psychiatry. 2005 May). This research may partly explain the increased risk of developing schizophrenia for people who smoke cannabis / marijuana. New genetic tests being developed by companies provide the hope that eventually people who are genetically predisposed to schizophrenia can be identified before hand - which would then allow families the knowledge that allows them to minimize exposure to the environmental factors associated with schizophrenia -- so as to minimize the number of people who actually develop the disorder. 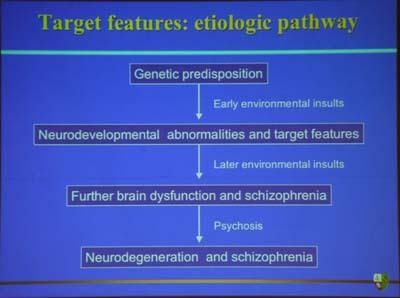 Some of the genetic factors that are being researched right now are multiple genes contributing to the disease (there are about a dozen genes that are leading candidates), and the possibility of epigenetic interactions (that is, certain genes and other biological molecules that determine whether and when certain genes present in the body are turned on or off) that may contribute to schizophrenia. 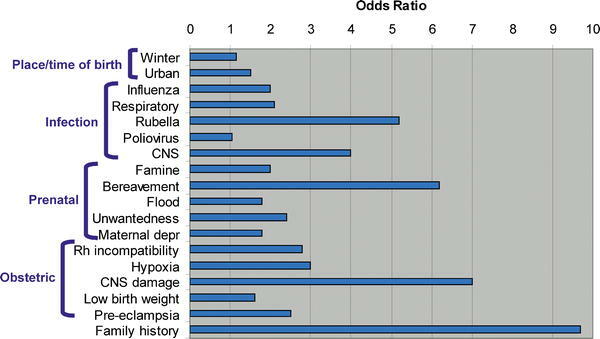 Following is a diagram that displays the increased relative risk (or "odds ratio" that is associated with some of the more well-researched environmental (and genetic) factors that have been linked with schizophrenia. In this diagram, the "odds ratio" represents the relative increase in risk associated with schizophrenia, where a "1" is average. So, a child born during the winter months (January through March/April, in the Northern hemisphere) has about a 10% higher risk of schizophrenia than average. A person born in an urban environment has about a 50% (with an odds ratio of 1.5) higher risk of developing schizophrenia. A child born from a mother who has Rubella has about a 500% increased risk of schizophrenia, etc. The "family risk" odds ratio identified below is much more difficult to estimate than the number below suggests - it depends upon (as mentioned in the genetic factors above) the level of interelatedness of the family member who had schizophrenia, and other brain disorders in the family. To get an accurate reading on this for any individual it is best to talk with a genetic counselor. Source: Public Library of Science, 2005 - Comparison of a Selected Set of Relatively Well-Established Risk Factors for Schizophrenia, Focusing Mainly on Pre- and Antenatal Factors  (abbreviations: CNS, central nervous system; depr, depression;). Please note that some of the well-known schizophrenia risk factors identified in the above diagram have been grouped together under one or more categories in the discussion points below. For example, bereavement (death of a close family member), as well as flood, the unwantedness of a child (i.e. if the pregnancy was unexpected and undesired at that time), and maternal depression, can all be considered to be different types of high stress environmental situations for the mother and child. Click on each hyperlink below to access further scientific information about that risk factor, as well as avoidance techniques for reducing your own risk. Excess Body Weight of Mother during pregnancy (above normal healthy pregnancy levels) is associated with a higher risk of child's development of schizophrenia in later life. Season of Birth - Mother's Low Sunlight Exposure/Lack of Vitamin D is associated with higher risk of schizophrenia in child. Older Age of Father increases risk of Schizophrenia. Vitamin D supplementation in boys during first year of life is associated with lower risk of schizophrenia. Childhood Exposure to Cats with the the T. Gondi virus may increase schizophrenia risk. Antioxidant Intake may reduce risks of schizophrenia and decrease side effects of medications. Celiac Disease ("wheat allergy") May Slightly Increase Risk of Schizophrenia for Certain Individuals - those affected may alleviate their symptoms with a gluten-free diet. Copyright 1996-2010. Schizophrenia.com. All Rights Reserved.